Snowshoeing under the Northern Lights, now that’s a memorable vacation. In the vicinity of Fairbanks, Alaska, the aurora borealis, or Northern Lights, are visible on average more than 200 days a year. Witnessing the Northern Lights clearly trumps any beautiful sunset over the ocean, hands down. Mother Nature’s unforgettable show draws visitors from the world over. 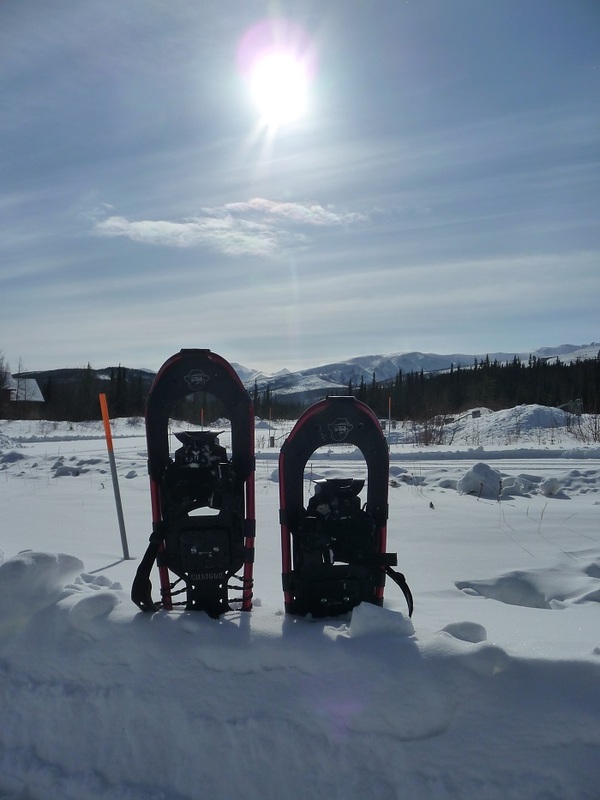 Popular as well is the sport of snowshoeing, where there are multiple options in and around Fairbanks. The stunning Northern Lights. Photo courtesy of Sherman Hogue. Located 358 miles north of Anchorage at the 64th parallel, Fairbanks is the state’s second largest city with a population of about 32,000. It sounds like a small city, but its appeal is world-renowned. That’s probably why Lonely Planet listed Fairbanks No. 2 on its Top 10 U.S. destinations for 2013. A good starting point to get your bearings is the Morris Thompson Cultural and Visitors Center (http://www.morristhompsoncenter.org/). This may just be one of the most interesting stops you make in Fairbanks. Located right downtown at 101 Dunkel Street, the center opened in the fall 2008, serving as the regional visitor center for Fairbanks and Interior Alaska. 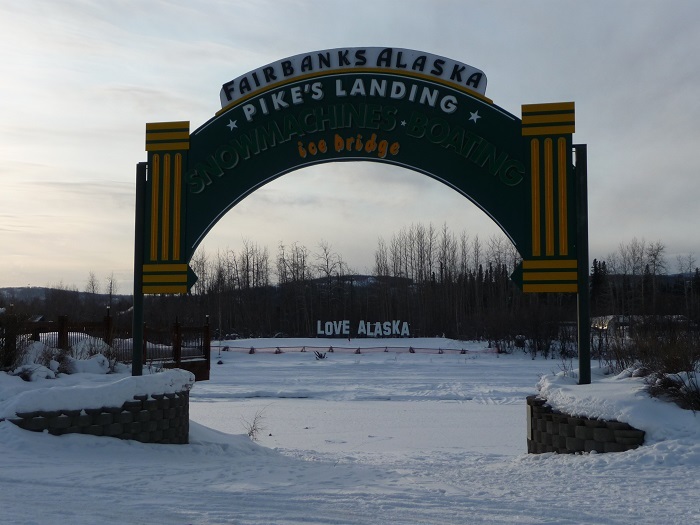 The Fairbanks Convention and Visitors Bureau, Alaska Public Lands Information Center, and Tanana Chiefs Conference have teamed up to provide tools that will help make any trip a success. You’ll find knowledgeable and friendly staff and volunteers, racks of informative brochures, daily hotel vacancy listings, information on where to snowshoe or where to rent snowshoes, local walking and driving tours, telephone and Internet access, and answers to all of your questions. In addition to trip planning services, there is a theatre showing free films and programs on Alaska’s natural, cultural, and visitor history, and an exhibit hall featuring 9,000 square feet of museum-quality interpretive displays and dioramas depicting Interior Alaskan landscapes and seasons. The center also offers an artisans’ workshop and demonstration area, an Elder gathering area, cultural and environmental education classrooms, outdoor recreational space, and an Alaska Geographic gift store. While visiting the Morris Thompson Cultural and Visitors Center, I discovered one of the outstanding venues in Fairbanks: Chena Hot Springs Resort (http://www.chenahotsprings.com/), located about 60 miles outside of town. With more than 440 acres and numerous scenic trails, Chena Hot Springs Resort is a popular destination with Japanese and other Asian cultures, as well as a snowshoer’s paradise. You could spend days exploring trails like Angel Rocks, Granite Tors, or Chena Dome, but there’s so much more to see and do. Chena Hot Springs Resort, founded more than 100 years ago, has become the most developed hot springs destination of the 124 geothermal areas in Alaska. Ranked in National Geographic’s list of top 10 winter destinations for 2013, Chena Hot Springs Resort offers healing mineral waters in Rock Lake, its natural outdoor hot springs, as well as the outdoor hot tub, and indoor family pool. Relax and enjoy the waters while also soaking up the majestic Northern Lights. If you are staying at the resort and wish to be awakened when the staff sees the Northern Lights, simply request the special aurora wake-up call. Just get up and walk a short distance to the “Aurorium,” a heated log cabin with large plate-glass windows facing northeast, and is open 24 hours a day. 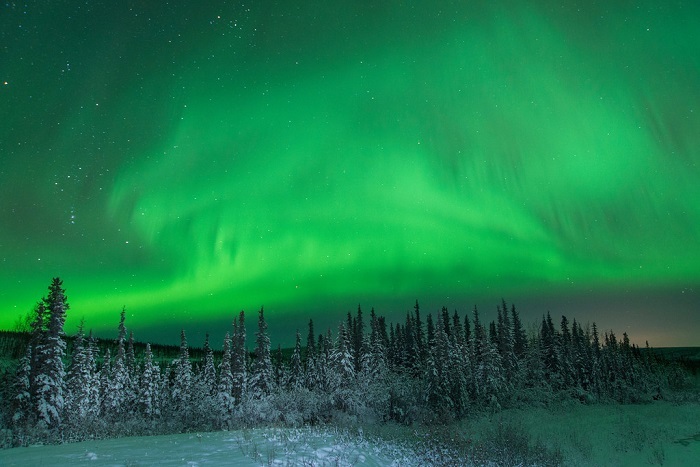 Fairbanks – Northern Lights ablaze at night time. Photo courtesy of Sherman Hogue. A few more reasons to appreciate Chena Hot Springs Resort include the Aurora Ice Museum and the sustainability efforts in growing vegetables. The ice museum is just that, a museum with everything inside made of ice, including tables, chairs, Christmas trees, and a variety of sculptures, all thanks to world champion ice carvers Steve and Heather Brice. 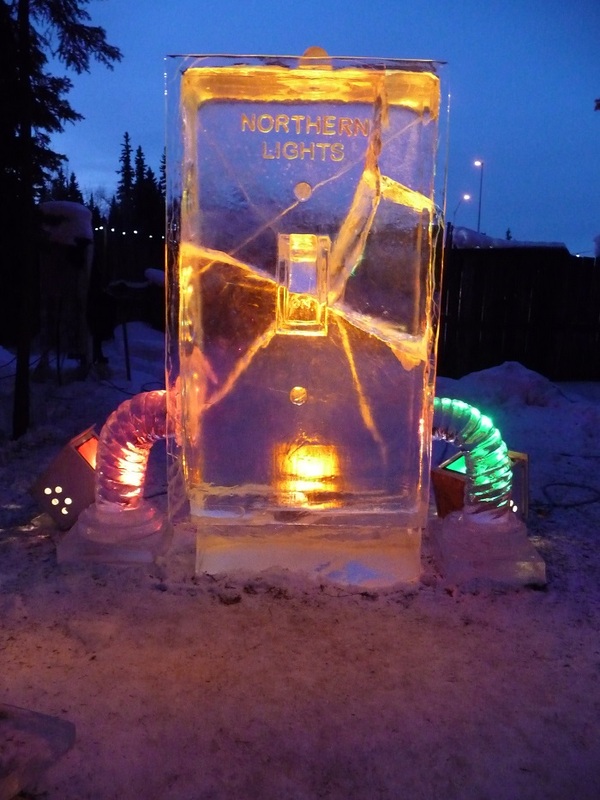 “Living in Fairbanks for an ice sculptor is like living in Italy near the marble quarries for a stone sculptor,” Steve muses. The resort also produces locally grown hydroponic lettuce, tomatoes, cucumbers, peppers, and small fruits for its restaurant and employee meals. When I inquired about the tasty salad, the waitress informed me that everything was hand-picked that morning. Annually, they produce more than 28,000 heads of lettuce and 25,000 lbs. of tomatoes; not bad when the temperature is 50 degrees Fahrenheit below zero! Another popular snowshoeing venue is Creamer’s Field Migratory Waterfowl Refuge (http://www.creamersfield.org/), a 2,000 acre state-owned wildlife refuge located just north of the city center on College Road. The pastoral focal points of the Refuge are the historic dairy buildings and the farm fields which now are used exclusively by migrating waterfowl and other wildlife. The Refuge also boasts wetland habitat and boreal forest habitat which are easily explored via miles of well-maintained walking trails. 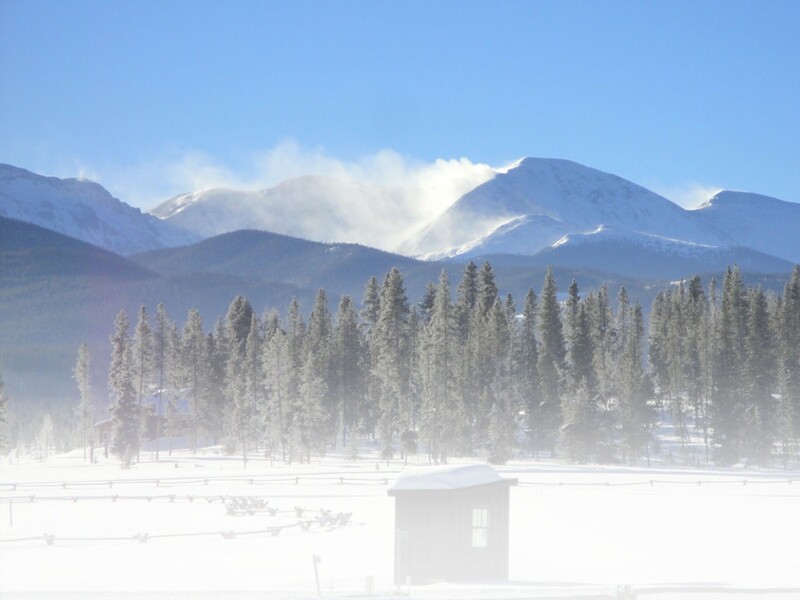 The Creamer’s Field trail system is open year-round and multi-use trails are groomed throughout the winter. In addition to the trails, there are viewing platforms around the margins of the fields as well as a Visitor Center and gift shop located in the historic Farmhouse. 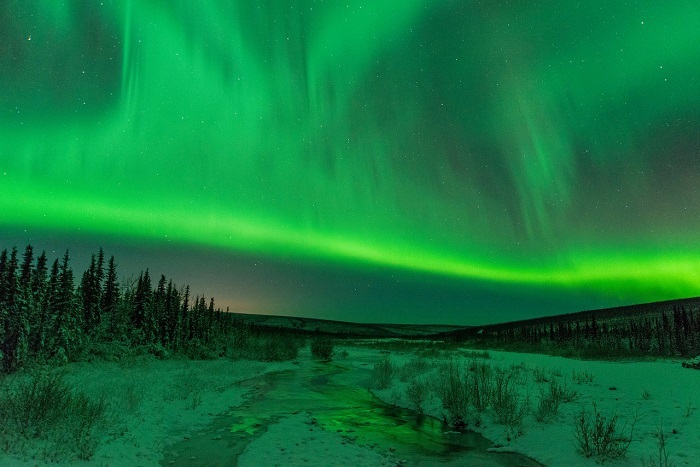 In addition to witnessing the Northern Lights, there are a few more things that you must see or do while in Fairbanks. 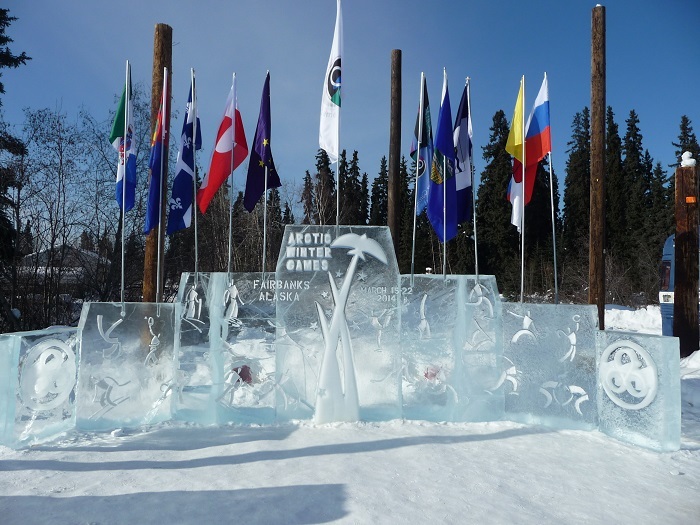 Fairbanks is home to the World Ice Art Championships, one of the largest ice sculpting competitions and exhibitions on earth. From its beginning in 1988, the World Ice Art Championships has grown to a month-long event featuring more than 70 teams from around the world. 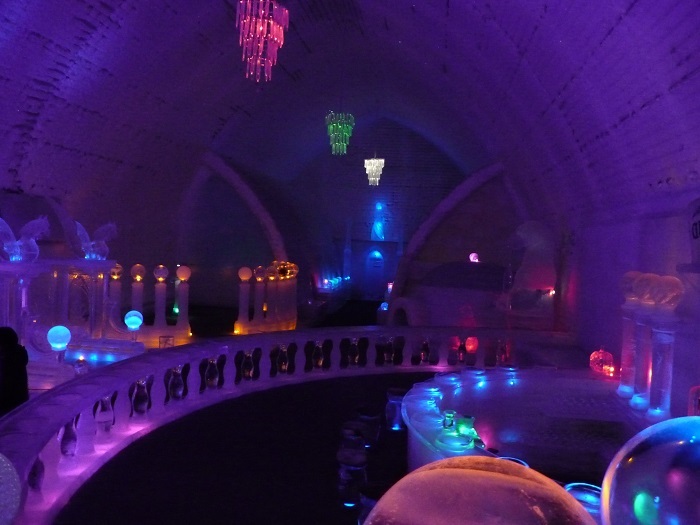 More than 45,000 visitors come to the Ice Park to see these intricately carved masterpieces. The theme for this year’s World Ice Art Championships is “A New Beginning.” The 2014 BP World Ice Art Championships will be open daily 10 a.m. – 10 p.m., February 24 through March 30, 2014. (http://www.icealaska.com). The University of Alaska Museum of the North is a thriving visitor attraction, a vital component of the University of Alaska Fairbanks, and the only research and teaching museum in Alaska. Exhibit highlights include a 2,000-year spectrum of Alaska art, from ancient ivory carvings to contemporary paintings and sculpture, in the Rose Berry Alaska Art Gallery; the state’s largest public display of gold and Blue Babe, a 36,000-year-old mummified steppe bison, in the Gallery of Alaska; and an ever-changing sound and light installation driven by the real-time positions of the sun and moon, seismic activity and the aurora in The Place Where You Go to Listen. (http://www.uaf.edu/museum/). 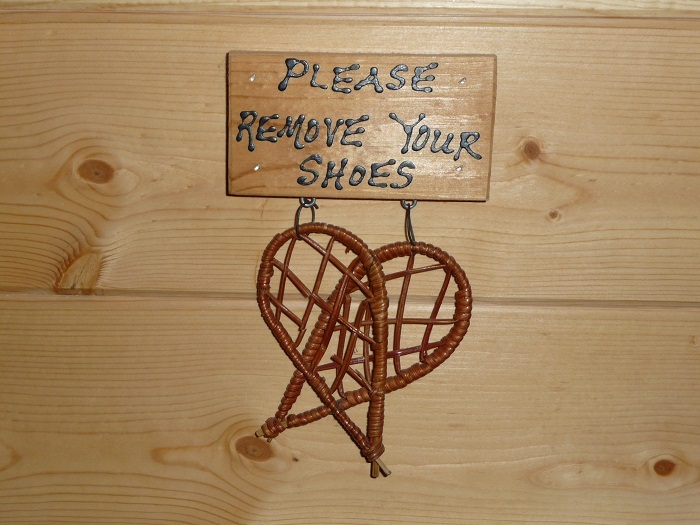 If you have a specific interest like snowshoeing and you’d like an Alaskan perspective, consider contacting a Fairbanks Golden Heart Greeter. These volunteers will share with you the passion of your interest, along with talking about all things Alaska. A Golden Heart Greeter can be scheduled by calling (907) 459-3758 or by e-mailing goldenheartgreeter@explorefairbanks.com. Allow a minimum of one week for a response. 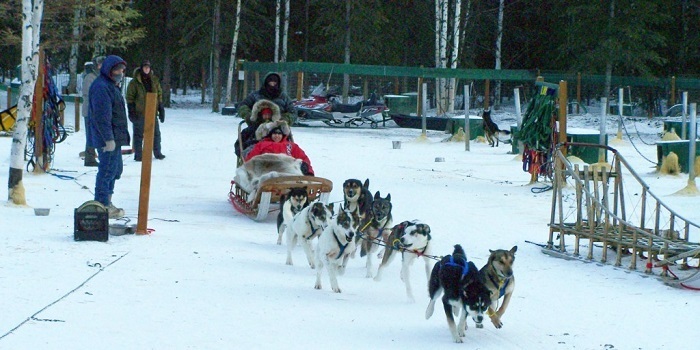 With so much to see in Fairbanks, a little planning will help maximize your visit. To get started, visit http://www.explorefairbanks.com/.